Sneakers are definitely a favourite shoe option this year. I am such a big fan of kicks, sneakers, runners whichever term you like to use, as they are so versatile. Let’s take a look at my four favourite sustainably stylish sneakers kicking green goals. I recently picked up these beauties and already they’ve become a favourite in my wardrobe! I love the sport luxe look of these sneakers, and I have chosen the colour “South Beach” which combines fuchsia and a fantastic teal green. These are the perfect addition to your activewear look, or combine with a pair of jeans or a pleated skirt to nail the latest street styles. Times have changed for Nike since 2001, when they were exposed for poor treatment of their factory workers through unacceptable work conditions and wages. For over a decade they have been working on improving their sustainable practices and have made strong progress with their environmental and social targets. For example, currently 86% of Nike’s contract factories have reached a performance rating that demonstrates their commitment to valuing workers and improving environmental standards. Nike is aiming for 100% by 2020. It's good to see They are Just Doing It! 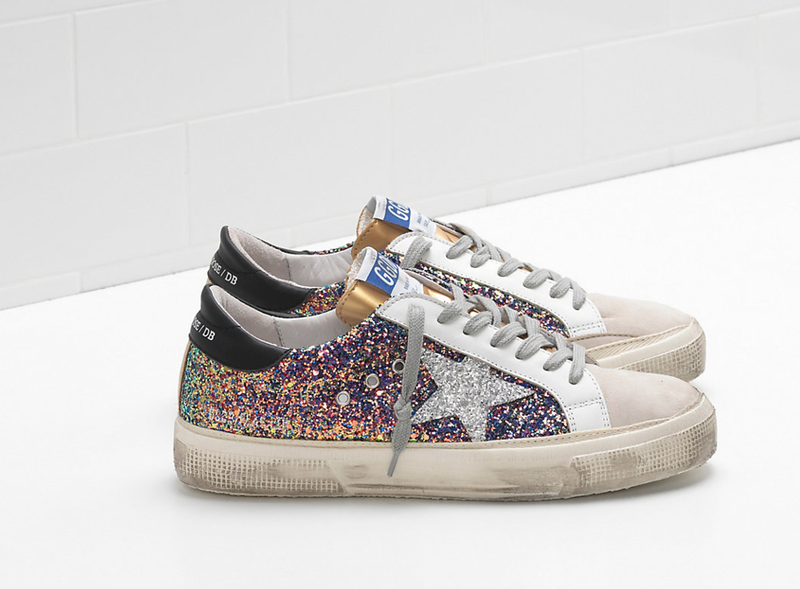 Get instant street cred with these glam glitter sneakers by GGDB. Featuring their winning trademark worn in look it’s not hard to see why these these babies are loved by fashion tastemakers and celebs. The May sneaker is the perfect addition to any wardrobe, and will definitely have heads turning as you pair these with an adorable daytime dress, or your favourite pair of Levi’s 501 inspired jeans. Every pair of GGDB sneakers is hand made in Italy making them even cooler. Being a high end made product, they will last longer giving you greater value for money. As an owner of a few pairs, I can vouch for the fact that they are built to last, fun and effortless to style and a sustainable fashion choice. The Adidas AlphaBounce 1 Parley sneaker is an essential item for every wardrobe this season. This amazing white sneaker can be paired with jeans, pants, skirts and dresses. They will provide you with comfort without compromising on style. They also come in other colours to spice up your entire wardrobe. The thing I love most about these runners is that they’ve been created with yarn by Parley Ocean Plastic™ which is made from recycled ocean plastic waste, that have come from beaches and coastal communities before it reaches the ocean. Adidas have teamed up with Parley Oceans Plastics to repurpose the millions of kilograms of plastic currently polluting the world's oceans. It's great to see a big brand make a solid commitment to reducing the environmental impact of the materials they use and support the use of recycled or sustainable materials. Giesswein 100% merino wool runners without a doubt are the most comfortable shoe on the street. Being a proud owner of a pair I can honestly make this call. Made out 100% wool, these runners can absorb and can carry away moisture which means no more sweaty feet or embarrassing odour. In contrast to other makes, these sneakers feel better without socks or a socket. my heels give a big sigh of relief everytime I slip mine on. Rest assured comfort isn’t their only feature. Unlike other wool sneakers on the market, They are also stylish enough to confidently take you from the treadmill to tapas without feeling insufficiently dressed. Head to Merino Country the sole supplier in Australia for these wonder shoes. How sustainable are Giesswein? They go to the top of the list for sustainable footwear. Their whole focus is about their treatment of wool and sustainable practices that produce a monumental target of 0% waste. You can’t do better than that! Here you have it fashionistas, my top four sustainably stylish sneakers, that will not only turn up your style dial but help you do good for the planet. I’d love to hear what sustainable sneaker brands you love and why?. Mention me @sustainablestyling and tag #sustainablestyling on Instagram and facebook. For more sustainable styling tips download my free checklist and sign up to my regular musings to receive 25% off all styling services. Here’s to happy healthy and eco-stylish feet.